Jesus punctuated his public ministry with astounding deeds. He caused the lame to walk, the blind to see and the deaf to hear. He fed multitudes and stilled storms. He healed the sick and cast out demons. He even raised three people from the dead. And he put the finishing touch on his amazing ministry by rising from his own grave. As this book demonstrates, all of Jesus' miracles unite their voices to tell us emphatically that we do not have to be in any doubt about his identity. He was none other than God in human flesh, and he came to this earth to provide the way for sinners to be forgiven and to have a right standing with God. His miracles tell us the truth about him and about the salvation he came to provide. God's Good News In The Miracles Of Jesus by Roger Ellsworth was published by Day One in November 2013 and is our 44938th best seller. 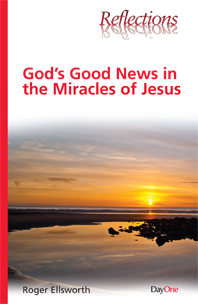 The ISBN for God's Good News In The Miracles Of Jesus is 9781846254079. Be the first to review God's Good News In The Miracles Of Jesus! Got a question? No problem! Just click here to ask us about God's Good News In The Miracles Of Jesus.